For some reason, the P-38 just doesn't seem to be an aircraft that many people talk about. At least, not in the shows I have visited or in conversations with friends. Perhaps it is because it doesn't have the appeal of a Mustang or Thunderbolt. Perhaps it is because it is due to it being a twin engined fighter (America's only successful one other than the huge P-61). Or it could be the twin booms, which some seem to think makes for a more difficult model to build. There are no real lack of available kits in 1/72, with the Hasegawa one being very nice and readily available. There is also a nice P-38M produced by Dragon and the older, but still buildable kit from Revell. Going back farther, there is an Airfix variant that gets built from time to time and undoubtedly some others I have forgotten to mention. I'm sure that Academy will reverse engineer the Hasegawa kit to give it engraved panel lines some time in the near future. This sheet is typical of later Superscale sheets. That is to say it is well researched and provides an excellent instruction sheet. 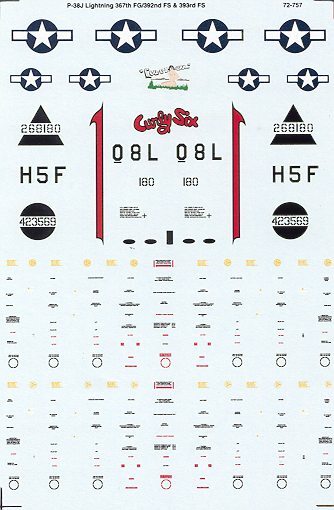 It also only has two subjects, but includes a full suite of data and insignia markings for both of them. The first plane is the 392nd FS 'Lou-E-Z-Ann' from late 1944. This P-38J is in overall natural metal which isn't very colorful, aside from the required pretty girl nose art, but there you have it. 'Curly Six' is the other P-38J from the 393rd FS. Like its fellow 367 FG P-38, this one is also in natural metal but has a nice red stripe on the outside of each engine cowling. 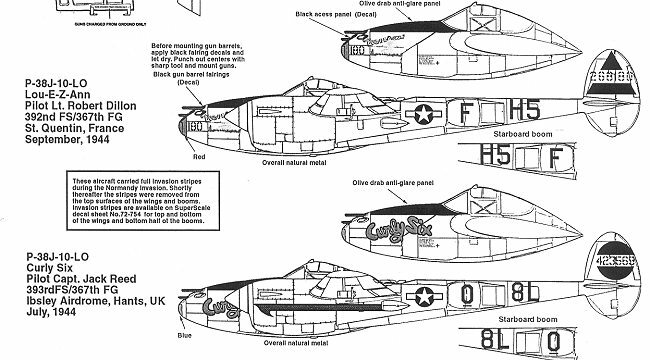 The instruction sheet states that both planes carried full invasion stripes at one time and later had the upper ones removed. Review copy courtesy of me and my wallet.